Weigela florida (Weigela florida): growing, planting, caring. A wonderful deciduous shrub with amazing flowering in the spring. Weigela is a genus of between six and 38 species of deciduous shrubs in the family Caprifoliaceae, growing to 1–5 m (3-15') tall. The leaves are 5–15 cm long, ovate-oblong with an acuminate tip, and with a serrated margin. The flowers are 2–4 cm long, with a five-lobed white, pink, or red (rarely yellow) corolla, produced in small corymbs of several together in early summer. Weigela florida was the first species to be collected for Western gardens, found by Robert Fortune and imported to England in 1845. Shrub with arching habit, with deciduous foliage measuring from 1 to 2 meters. The weigela bears sessile leaves, ovate-elliptic, acuminate. The spring bloom is traditionally pink, campanulate. Plant in spring or fall in ordinary, drained soil, in the sun or partial shade. Plant in a hole at least twice as big as the root ball. Soak the roots before planting, this will greatly improve the chances of recovery, regardless of the conditioning. You can form a bowl around the foot, which will be used for watering during the first months. Tamp the soil well around the roots (do not hesitate to use all the weight of the body). Water copiously. Mulch, with leaves or crushed wood, twice a year. Water regularly and generously for several weeks after planting. After, you only have to worry about watering if your plant is potted. Outside of these conditions, it will manage on its own, even handling dry soil better than moist soil. If you keep your weigelia potted, plan a to switch pot every 2 to 3 years, in some potting soil, a well draining pot, and slightly larger. If you mulch smartly, to have a soil covered all year, and a good intake of humus, an annual contribution of compost, in November, on the topsoil, will be enough to fertilize your weigelia. 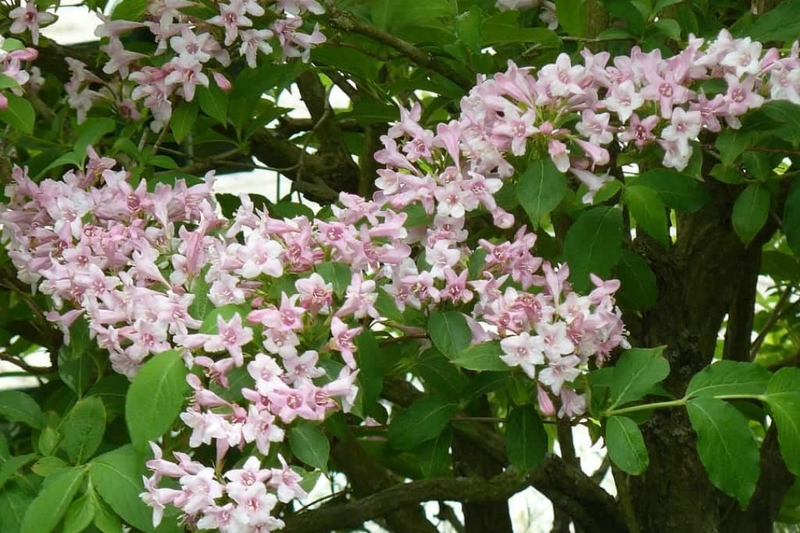 Prune your weigela after the flowering, every two to three years. The weigela flowers on the wood of the previous year, so cut the branches that have already bloomed. To gradually rejuvenate adult plants, select some aging branches and prune them at the base.